It'll take the unlikely unification of the Dark Knight and the Heroes in a Half-shell to overcome combined villainous forces afoot in Gotham City in the all-new, feature-length animated thriller, Batman vs. Teenage Mutant Ninja Turtles. Produced by Warner Bros. 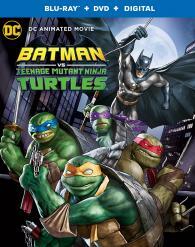 Animation, Nickelodeon and DC, the film arrives from Warner Bros. Home Entertainment. Batman vs. Teenage Mutant Ninja Turtles finds Gotham City reaching new levels of danger when Shredder joins forces with Ra's al Ghul to enact a nefarious plan – leading to the team-up of the Dark Knight and the Turtles to combat the combined might of the Foot Clan and League of Assassins!